Tropang TNT climbed out of the cellar after disposing of siter team NLEX, while Bgy. Ginebra finished strong to beat Blackwater in tonights action from the 2016 PBA Commissioner’s Cup. Tropang TNT shook off some of their struggles after riding a hot 29-4 start towards a tough victory over sister team NLEX, 85-80, in the 2016 Oppo PBA Commissioner’s Cup on Sunday at the Philsports Arena. TNT, the defending second conference champions, saw a lead of as high as 27 whittled down to just three in the endgame, but they made the necessary plays to see it through. Import David Simon had 23 points, 16 rebounds, 3 steals, and 4 blocks, while Jai Reyes and Harvey Carey each added 11 markers. 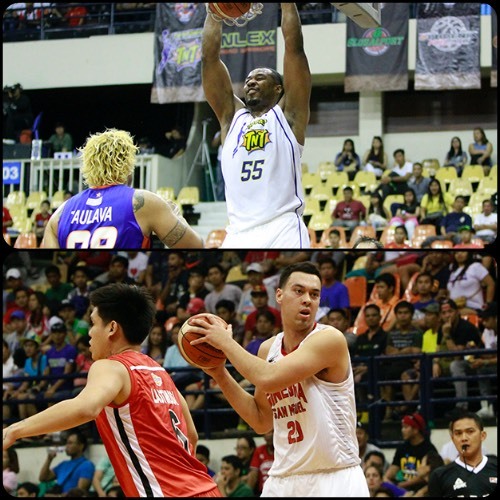 Ranidel De Ocampo and Matt Ganuelas-Rosser also chipped in with nine points apiece. Al Thornton exploded for NLEX with 35 points and 15 rebounds, while substitute Garvo Lanete turned in another impressive outing with 20 points off the bench. David Simon (TNT) - 23pts, 16rebs, 1ast, 3stls, 4blks. Al Thornton (NLX) - 35pts, 15rebs, 2asts, 1stl, 1blk, 2 triples, 10/17 FGs. The Bgy. Ginebra had a bit of a tough time beating Blackwater Elite, but the Gin Kings finished strong to notch their fourth win of the the OPPO PBA Commissioner’s Cup, 89-79. LA Tenorio and Othyus Jeffers both recorded splendid performances for Ginebra, which now sits at solo fourth place with a 4-3 slat. Tenorio had 20 points, 8 assists, 3 triples, and 4 rebounds, while Jeffers played efficiently to end up with 23 markers, and 14 boards. MJ Rhett had 24 poitns and 23 rebounds for the Elite (3-4), which is now in a four-way tie for seventh place with NLEX, Star, and TNT. Blackwater’s starting backcourt of Mike Cortez and Carlo Lastimosa paired up for 31 points, but they shot just 12/25 from the floor on top of 5 turnovers. Ginebra utilized crisp ball movement in this one, assisting on 25 of their 35 field goal makes. They also used their size advantage well, outscoring the Elite in the paint, 48-34. That was mainly because of Greg Slaughter and Japeth Aguilar combining for 30 points and 17 caroms. Othyus Jeffers (GIN) - 23pts, 14rebs, 6asts, 2stls, 9/14 FGs. MJ Rhett (BLA) - 24pts, 23rebs, 4asts, 2stls, 1blk, 9/15 FGs.